Susquehanna County lies in the upper northeast corner of Pennsylvania. By most accounts, it is a fairly nondescript place – roughly rectangular in shape, fairly rural, a little poorer and more Republican than average, but nothing to write home about. 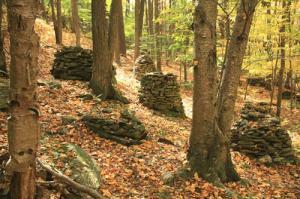 Or nothing, at least, besides the mysterious stone cairns that stand, silently, in the forests of Susquehanna County. You won’t see these bizarre constructs mentioned in the county’s Wikipedia page or local government website. But they’re there. A cairn, for those unfamiliar, is a manmade pile of stones. According to Wikipedia, they are typically conical, and may mark the summit of a mountain or a burial site (you can read about cairns in great detail here). In the northeastern United States, they oftentimes delimit the boundaries of an old field turned fallow (farmers, when clearing a field, would pile all the rocks alongside it). My friend’s grandparents have a wooded property in New York, for instance, and there is a rough series of cairn-like piles of stones bordering out what once was farmland. Those stones, though, were quite obviously at one point a wall. The Susquehanna stones aren’t so easily explained: they’re too haphazard to demarcate farmland, they don’t appear to be grave markers, and they certainly don’t indicate the summit of a mountain. The Susquehanna stones, in fact, are apparently the most extensive site of its kind in Pennsylvania. Theories abound as to their origin and purpose; some suggest they were erected by Native Americans, similar to the extensive burial mounds in Ohio. But there is no clear sign as to when they were originally built – Pennsylvania author Matt Lake writes that “no literary works, letters, or paintings from the colonial period mention odd rock piles in this part of the country … the oldest reference seems to date from an 1822 travelogue about a trip across New York State.” Princeton scholar Norman Muller, though, believes that the cairns were nonetheless erected well before then. The stones themselves provide no answers, though. They simply stand silently in the forest, intriguing and confusing the few visitors who happen upon them. Your blog really landed right on the mark. wonderful work, I look forward to your next entry. Incredibly interesting piece of content. I was in search of this article and I came upon yuor web blog on google. Thank you for offering this. A short roundup of interesting things!